IN his continuing search for the more weird, whacky and wondrous in the world of travel, David Ellis says colleague Graeme Willingham snapped this croc recently at Cahill's Crossing on the aptly-named East Alligator River in the Northern Territory. Graeme, a Melbourne-based PR consultant, says there were actually four crocs (well, four that he could see) taking advantage of a high tide and the barramundi racing across the causeway, and this particularly large fella stopped the traffic when pausing midstream on the way to deeper water on the other side of the rocks on the right. He had earlier been seen to snap a couple of unwary fish, so was probably comfortably full and, as Graeme muses, possibly thinking to him/herself: "It's my river, and it's my causeway, so I'll do what I bloody well like, when I like." 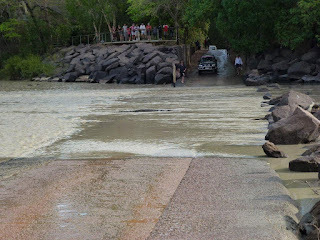 It brought no argument from tourists who backed-up in their cars and 4WDs on their way back to Jabiru in Kakadu National Park from the Stone Country Festival at Gunbalanya (Oenpelli), in nearby Arnhem Land.